Although I have stepped back from active involvement in the European Architectural History Network (EAHN), I am happy to note and share information about the preparations for the organization’s next biennial conference in 2020. After earlier international conferences in Guimarães, Brussels, Turin, Dublin, and Tallinn, the sixth edition will take place in Edinburgh. If you have been considering organizing a panel or roundtable on any aspect of architectural history – from antiquity through medieval, early modern, or modern and contemporary – this offers an excellent opportunity! 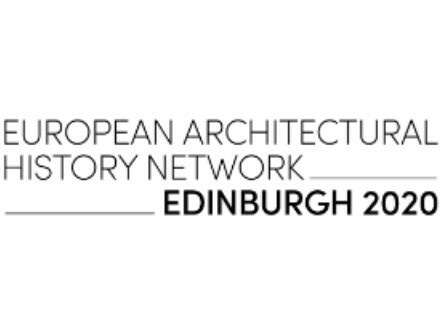 The European Architectural History Network is delighted to announce its next biannual meeting at the University of Edinburgh, UK, 10-13 June 2020. In accordance with EAHN’s mission, the meeting aims to increase the visibility of the discipline of architectural history, to foster transnational, interdisciplinary and multicultural approaches to the study of the built environment, and to facilitate the exchange of research in the field. EAHN is a European organisation, but its intellectual scope is global, and the meeting welcomes proposals on any architectural historical topic. As well as topics on any aspect of the built environment, proposals on landscape and urban history are also very welcome, along with proposals dealing with the theories, methodologies and historiographies of architectural history. Proposals are sought in two basic formats: (1) a Session, and (2) a Roundtable debate. A Session should consist of 4-5 paper presentations, with a respondent, and time for dialogue and discussion at the end. A Roundtable debate should be an organised as a discussion between panel members, and the format would suit topics of particular urgency, or contemporary relevance. Roundtables should also aim to activate audience discussion as far as possible. Sessions and Roundtables may be chaired by more than one person. Anyone wishing to chair a Session or a Roundtable debate at EAHN2020 are invited to submit proposals by 31 December 2018. Chairs should make clear whether their proposal is a Session, or a Roundtable. Please note that EAHN is self-funding, and chairs are expected to provide all their conference expenses, including travel and accommodation. Please visit the conference website to submit a session proposal, or for further information. Elizabeth Merrill has organized the upcoming conference Spaces of Early Modern Architectural Production at the Max Planck Institute for the History of Science in Berlin. The conference forms part of a working group on the topic that began with a video conference last fall, and will continue after the conference with a members-only workshop. I am looking forward to participating with my talk “Network Structures: Exploring the Architectural Spaces of the Theatine Archipelago,” and hearing the other talks with interdisciplinary perspectives at the intersection of history of architecture and history of science. structures, knowledge systems and people integral in the making of architecture. Image above from my talk: Frontispiece to Girolamo Vitale, Lexicon Mathematicum, 2nd ed. 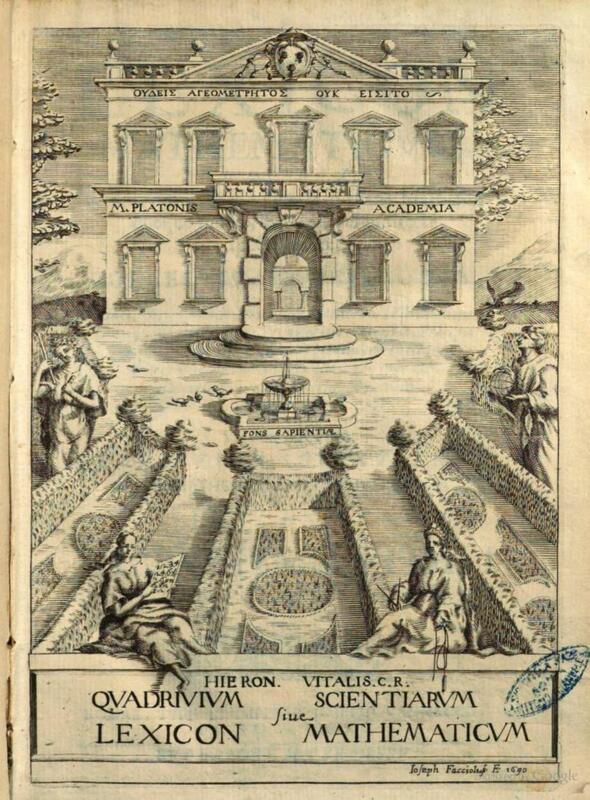 (Rome: Vannacci, 1690). 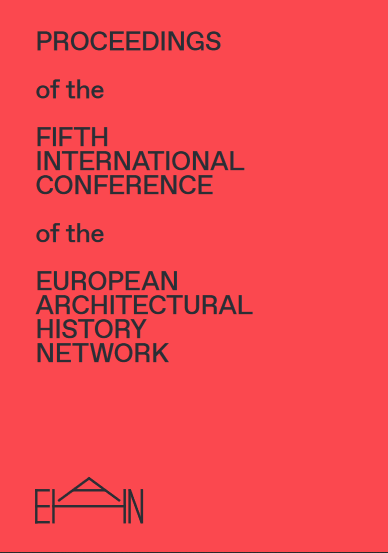 The detailed program for the European Architectural HIstory Network (EAHN) Fifth International Meeting is now available on the conference website. 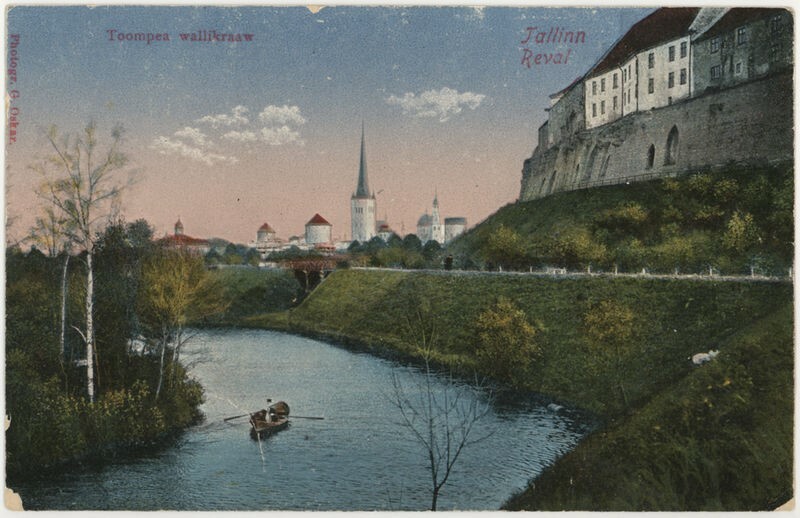 Conference events include keynote talks by Christine Stevenson, Krista Kodres, and Reinhold Martin, as well as a fascinating program of tours around Tallinn and other sites in Estonia. Twenty-eight panels and roundtables, organized in five sessions and five thematic tracks, furnish rich content across a range of periods, methodologies, and geographies. Conference registration is open, with special early bird registration rates available until 30 March. Late registration at higher rates will be available until 20 May. The conference website has complete information about registration categories and rates. 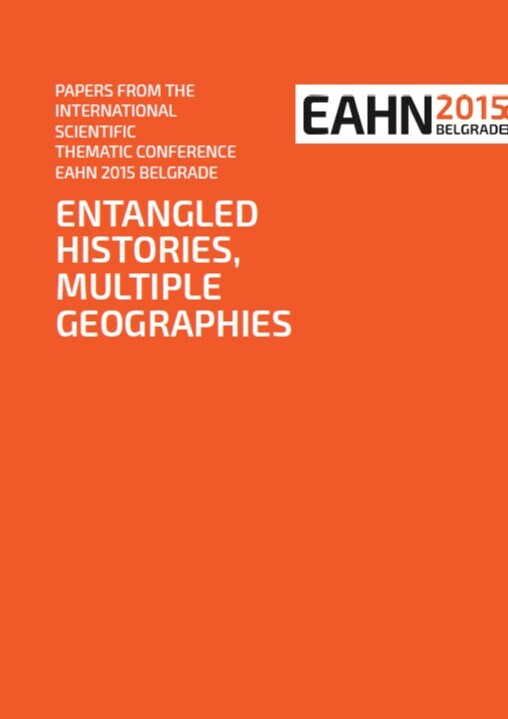 Most of the papers presented in October 2015 at the European Architectural History Network regional thematic conference Entangled Histories, Multiple Geographies are now available in the conference proceedings. At just over 300 pages, the proceedings include thirty-seven papers, many with numerous illustrations. Contributions consider chronologies from ancient, medieval, and early modern through modern and contemporary, with topics examining issues such as cultural transfer, historiography, restoration, identity, and the politics of conflict. The conference featured a distinct emphasis on central and eastern Europe, as well as the eastern Mediterranean region, although other geographies were also represented. 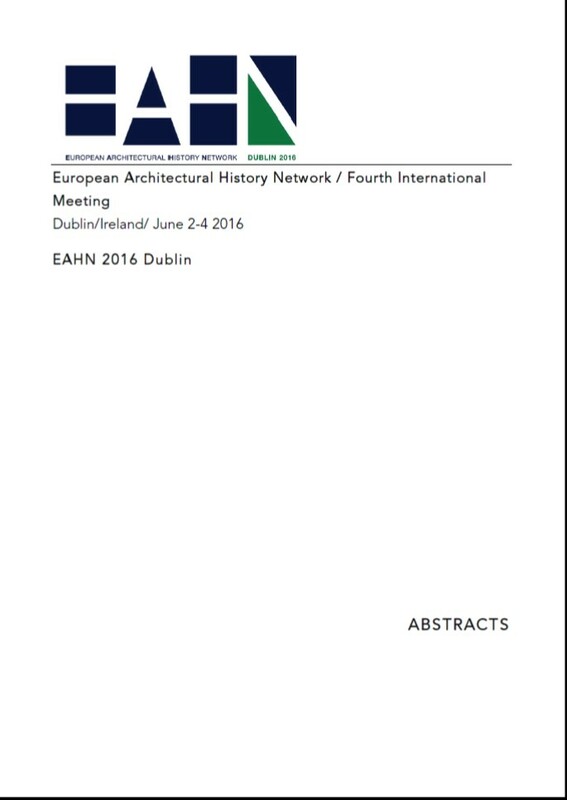 Click here to download the EAHN 2015 proceedings. Last week, the Turin newspaper La Stampa reported that some stucco fell off a rusticated quoin-like corner pilaster of the facade of San Lorenzo. Fortunately no one was injured when the debris landed on Piazza Castello below. The incident recalls the one in Modena last year, when portions of a corner capital at Guarino Guarini’s Theatine casa of San Vincenzo (now a courthouse) broke off and landed on the Canal Grande street below. The photo gallery below takes advantage of La Stampa‘s generous Creative Commons CC BY-NC-ND 4.0 licensing for local reporting to share some images of the damage. 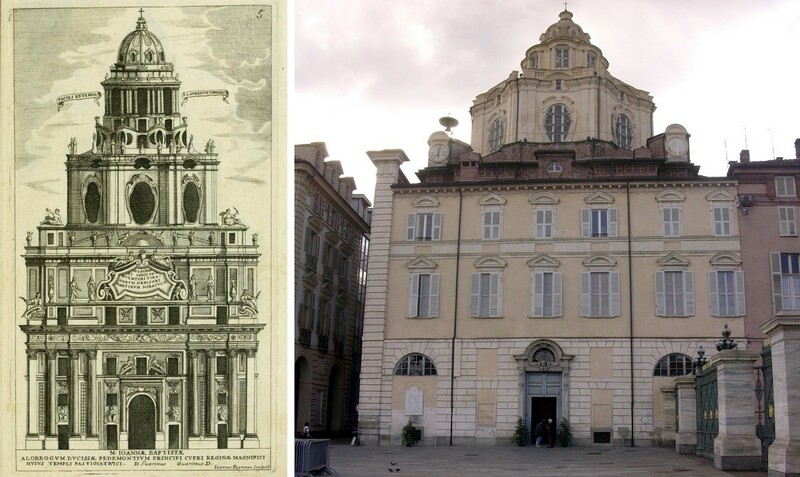 The San Lorenzo facade predates Guarini’s arrival in Turin in late 1666. It is already visible in close to its current form in a fresco in the Stanza delle Magnificenze (c. 1662-65) at the Castello del Valentino. Originally an open portico on the ground floor with rooms above, the openings to the piazza were walled up in 1661, creating what now serves as the church’s narthex. Guarini’s church thus rose behind this preexisting portico block when it was constructed from 1670-1680. 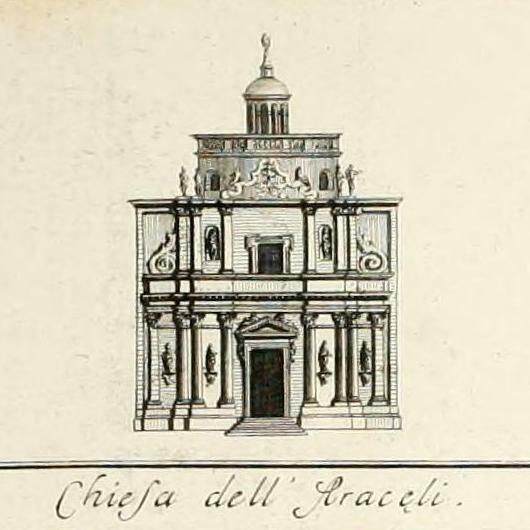 Guarini’s own plans for the facade called for covering the existing structure with a kind of sheathing of pilasters, columns, and rich ornaments, possibly inspired by an unexecuted design (c. 1643) by Antonio Maurizio Valperga for the facade of the adjacent Palazzo Ducale, now Palazzo Reale. When Guarini’s design, too, remained unexecuted, and with few other intervening changes, the church facade still essentially corresponds to the state seen in the fresco at Valentino (view the fresco in the video at the bottom of this post). Henry A. Millon, review of G. M. Crepaldi, La Real Chiesa Di San Lorenzo in Torino, Turin, 1963, in Art Bulletin 47, no. 4 (Dec. 1965): 531-532; here 531. Susan Klaiber, Guarino Guarini’s Theatine Architecture, Ph.D. dissertation (Columbia University, 1993): 204-207; 216-218; 277-280. Susan Klaiber, “Le fonti per San Lorenzo,” in G. Dardanello, S. Klaiber, and H. A. Millon, editors, Guarino Guarini (Turin: Umberto Allemandi & C., 2006): 328-337. Although I am not involved with planning the next biennial EAHN conference, I am delighted to note the rich and stimulating Call for Papers for the Fifth International Meeting in Tallinn next year. The conference website describes the twenty-seven panels in detail. If you prefer a PDF, download it here. Take a look, there’s something for (almost) everybody! Abstracts are invited for the fifth European Architectural History Network International Meeting, in Tallinn, June 2018. Please submit your abstract by 30 September 2017 to one of the sessions and round tables listed below. Abstracts of no more than 300 words should be submitted straight to the session convenor(s). Include your name, affiliation, title of paper or position, a C.V. of no more than five pages, home and work addresses, e-mail addresses and telephone numbers. Sessions will consist of either five papers or of four papers and a respondent with time for questions and dialogue at the end. Each paper should take no more than 20 minutes to present. Abstracts for session presentations should define the subject and summarize the argument to be made in the presented paper. The content of that paper should be the product of well-documented original research that is primarily analytical and interpretive rather than descriptive. Round tables will have no more than six participants plus chairs and an extended time for dialogue, debate and discussion among participants and their public. Each discussant will have 10 minutes to present a position. Abstracts for round tables should summarize the position to be taken. Papers may not have been previously published, nor presented in public. Only one submission per author will be accepted. All abstracts will be held in confidence during the selection process. Session and roundtable chairs will notify all persons submitting abstracts of the acceptance or rejection of their proposals and comment upon accepted ones no later than 31 October 2017. Authors of accepted paper proposals must submit the complete text of their papers to their chairs by 15 February 2018. Chairs may suggest editorial revisions to a paper or position in order to make it satisfy session or round table guidelines and will return it with comments to the speaker by 15 March 2018. Chairs reserve the right to withhold a paper or discussion position from the program if the speaker has refused to comply with these guidelines. It is the responsibility of the chair(s) to inform speakers of these guidelines, as well as of the general expectations for both a session and participation in this meeting. Each speaker is expected to fund his or her own registration, travel and expenses to Tallinn, Estonia. Consult the EAHN 2018 conference website for full details about deadlines, venue, and other conference information. No paper may have more than two authors. Final presented papers should be no more than 2500 words, although texts of up to 4000 words, including notes, may be included in the proceedings (submission to the proceedings is optional). Initial position statements should be no more than 1250 words. Position statements of up to 2500 words including notes will be accepted for the proceedings (submission to the proceedings is optional). Click here to download this CFP in PDF form. The European Architectural History Network is pleased to announce its Third Thematic Conference Urban Histories in Conflict. On the 50th anniversary of the Israeli occupation of East Jerusalem and the contentious unification it legislated, the conference aims to open up questions about the purpose of writing histories of urban conflicts. 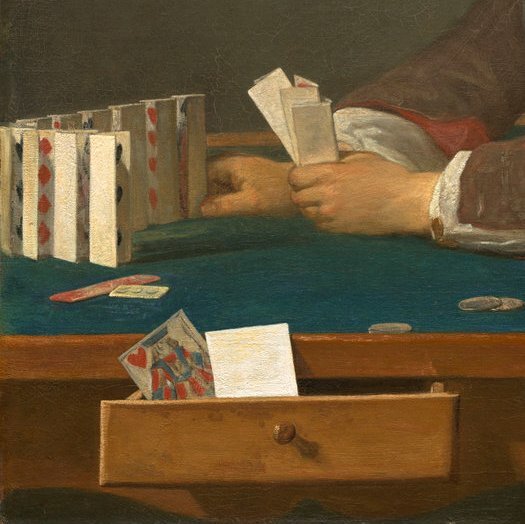 We ask how can historians account for the predicaments of violence and uneven distributions of power in the built environment, particularly in the face of current worldwide geo-political crises. Download the full call for papers or consult the EAHN website for the latest conference updates. Key Dates: abstract submission by 2 December 2016, full papers due by 1 May 2017. The EAHN Fifth International Meeting (Tallinn, 13-16 June 2018) Call for Session Proposals deadline is 12 December 2016. Download the call for sessions, or visit the conference website for more information. After Guimarães 2010, Brussels 2012, Turin 2014, and Dublin 2016, the European Architectural History Network‘s Fifth International Meeting will take place in Tallinn from 13-16 June 2018. Please note the recently published call for session proposals available on the conference website – the due date is 12 December 2016. Or download a PDF of the EAHN 2018 Call for Session Proposals here. Abstracts of the papers in the sessions and roundtables of the European Architectural History Network’s Fourth International Meeting can now be downloaded from the conference website. The full program of tours, keynote presentations, and other events may also be consulted there. With a little more than a month to go until the conference, registration is still open. If the abstracts whet your appetite for a trip to Ireland with a few intense days devoted to great offerings for architectural historians, this is the time to sign up! The EAHN 2016 organizing committee has announced the roster of speakers and papers for the sessions and roundtables at the upcoming EAHN 2016 conference in Dublin. Over 150 participants will be chairing or presenting in the twenty-four panels from 2-4 June 2016. Topics range from medieval tower houses through Georgian architecture to “Architecture of the Antipodes”, time travel, and big data. For the complete listing of session topics and paper titles, visit the conference website or download the PDF of the conference roster. By the way – early bird rates for conference registration are available before 1 March 2016. Maps above: the urban development of Dublin from 1682 through 1915. Click on images for details. Occasional updates regarding my work, organizations with which I am involved, or other topics of interest. Enter your e-mail address to subscribe and receive notifications of new posts by e-mail. This image gallery tracks the progress of my translation of the architectural portions of Heinrich Brauer and Rudolf Wittkower, Die Zeichnungen des Gianlorenzo Bernini, 2 vols., Berlin: Keller, 1931. Projects in the gallery represent translation sections completed or underway. Starred projects (*) were unexecuted or destroyed. All images in the public domain. Posts to this News section originating elsewhere (such as press releases and CFPs) and RSS feeds in the sidebar are not included in the Creative Commons Attribution-NonCommercial-NoDerivs 3.0 Unported License that applies to the rest of this site. Except where otherwise noted, all content originating on this site is licensed under a Creative Commons Attribution-NonCommercial-NoDerivs 3.0 Unported License. © Susan Klaiber, 2012-2019. Unauthorized use and/or duplication of this material without express and written permission from this site's owner is strictly prohibited. Excerpts and links may be used, provided that full and clear credit is given to Susan Klaiber with appropriate and specific direction to the original content. Information about header images available on the Contact page.